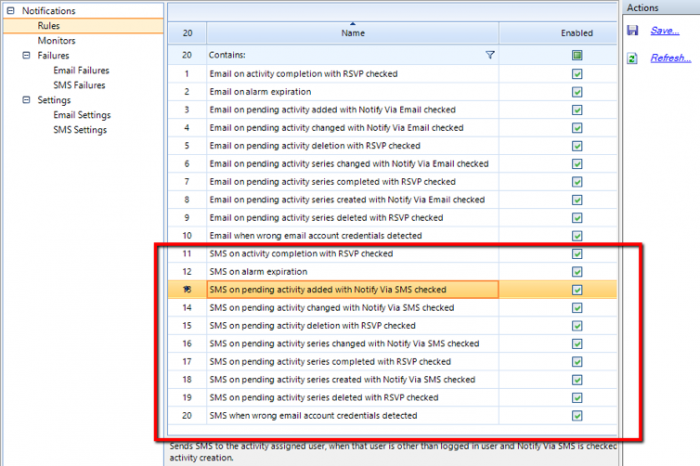 This article will walk you through how the SMS notification service can be used in wMobile. 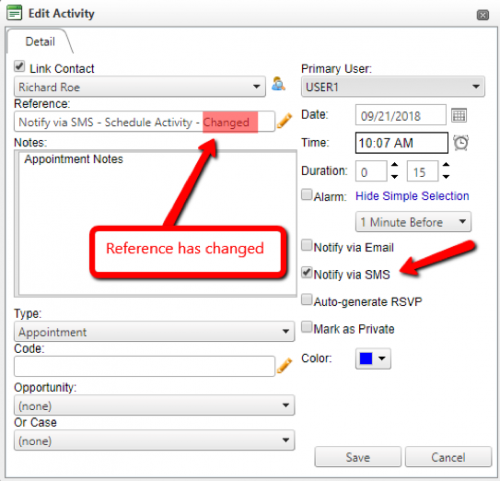 To learn more about configuring SMS information on notification rules, read this blog post. 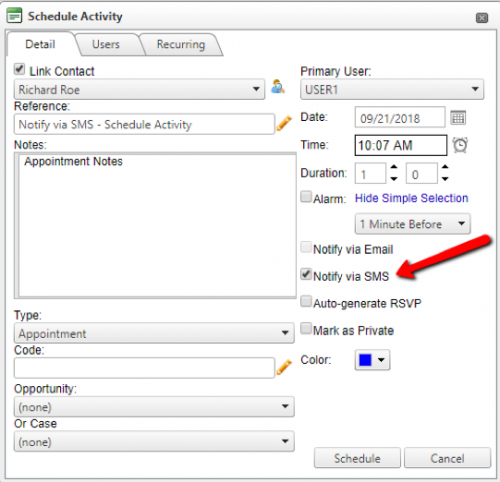 Notify via SMS – occurs when the Notify via SMS checkbox is ticked when scheduling or updating an activity. 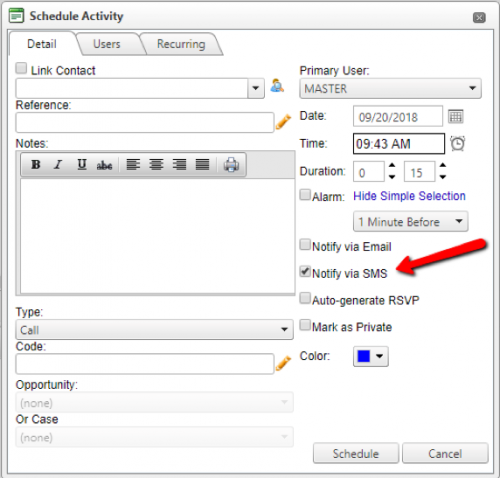 In this case, the assigned user(s) will be notified when other users schedule or modify the activity he/she has been assigned to. 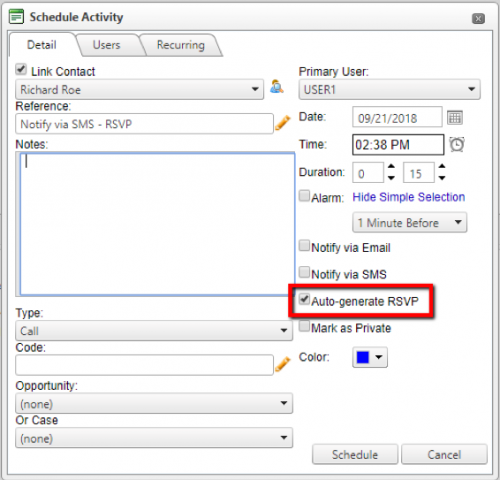 RSVP notifications – occur when Auto-generate RSVP checkbox is ticked, and a user will complete or delete the specified activity. In this case, the user that created the activity will be notified when somebody else completes or deletes the activity. 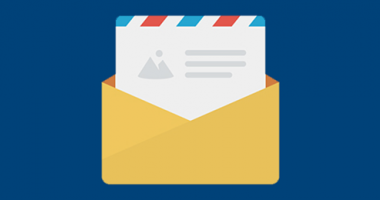 In this section, we’ll see how SMS notifications are sent when users are creating, changing, deleting or completing individual activities. We’ll see how notifications are sent to the assigned user if he/she is different than the creator, when an activity is scheduled. The assigned user will also receive a change notification if somebody else changes the activity. 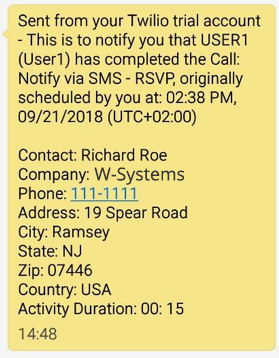 USER1 will be notified that an activity has been scheduled and assigned to him. 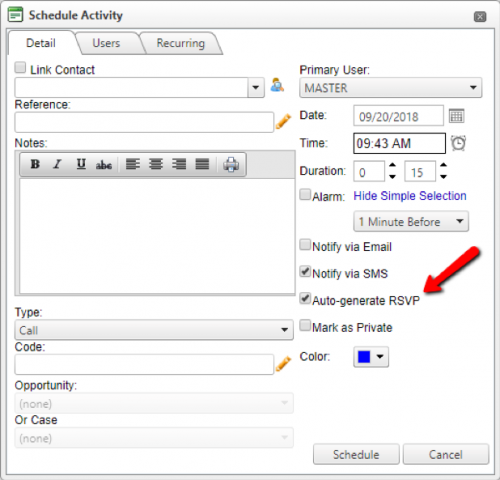 With RSVP the creator will be notified about activity completion and deletion if those actions have been performed by another user. 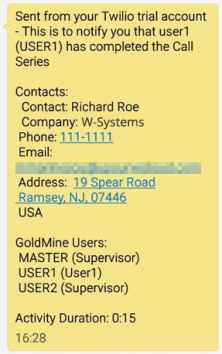 MASTER creates an activity and assigns it to USER1. 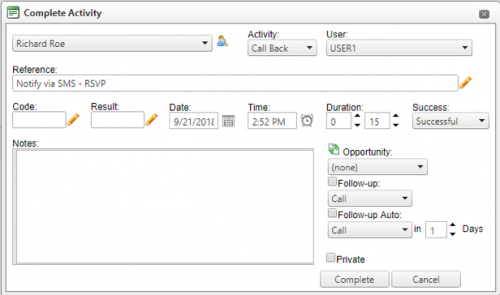 Next, when USER1 completes the activity, MASTER will be notified about that action. 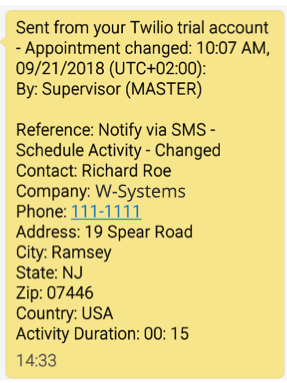 MASTER has been notified by SMS that USER1 has completed the activity. The first part of this scenario is similar to the activity completion scenario above. 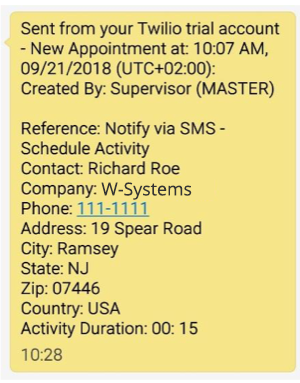 MASTER schedules an activity for USER1. 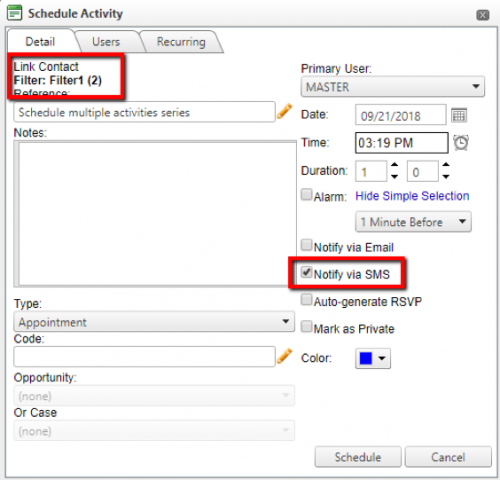 Multiple activities series – that is created when an activity is scheduled to multiple users/contacts. 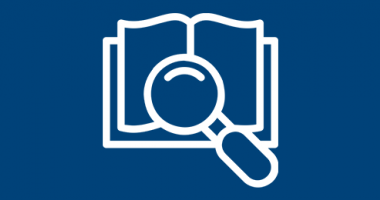 Recurring activity series – that is created when recurring activities are created. 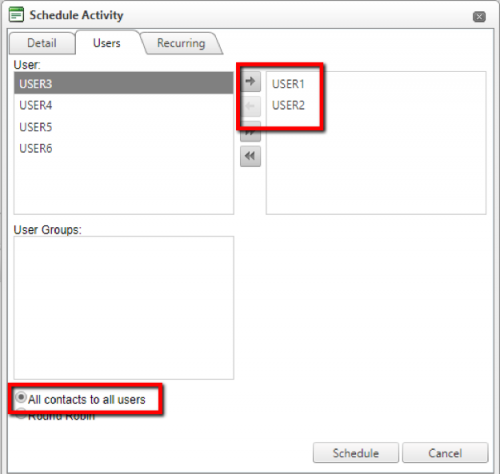 After the activity is scheduled, both USER1 and USER2 will receive a notification about the newly created activity series. MASTER user will not receive such an SMS because he is the creator. 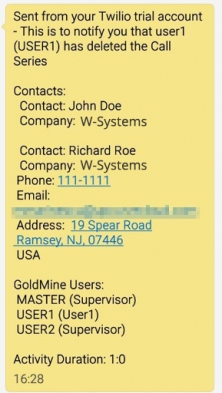 In this scenario we’ll consider that we have an activity series created as above, and the creator, MASTER user in this case, changes the reference for all activities in the series. 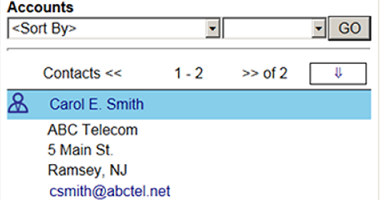 The other users, respectively USER1 and USER2, will receive an SMS after the series has been changed. In this case the message is similar to the ones related to activity series creation or change. 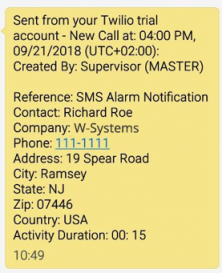 By default, alarm notifications are not enabled in wMobile. 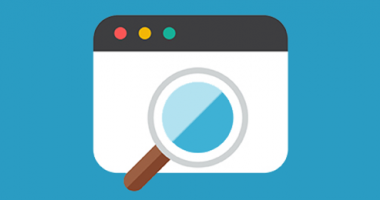 If you want to use them, you need to enable them from the Manager Console, and we’ll show you how to that in the next sections related to notification services configuration. 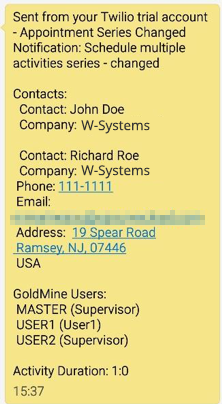 Once this behavior is enabled, wMobile will send an SMS notification to the assigned activity user when an alarm expires. Let’s assume that USER1 has an activity scheduled at 4:00 PM with an alarm that is set 10 minutes before. 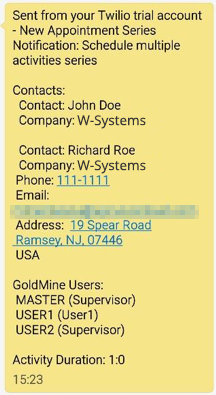 wMobile uses background tasks called Event Monitors to trigger time flow related events and send notifications to the appropriate users. In this case, the task is called Alarm Monitor. The Alarm Monitor checks each minute for expired alarms and notifies the assigned users. 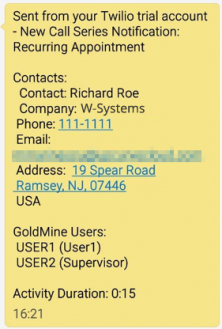 This article applies to wMobile 4.0.0547 and above.